How does an “inverted” classroom train future leaders? International relations student Shreya Nayak is gaining crucial real-life experience in an innovative U of T classroom experiment. 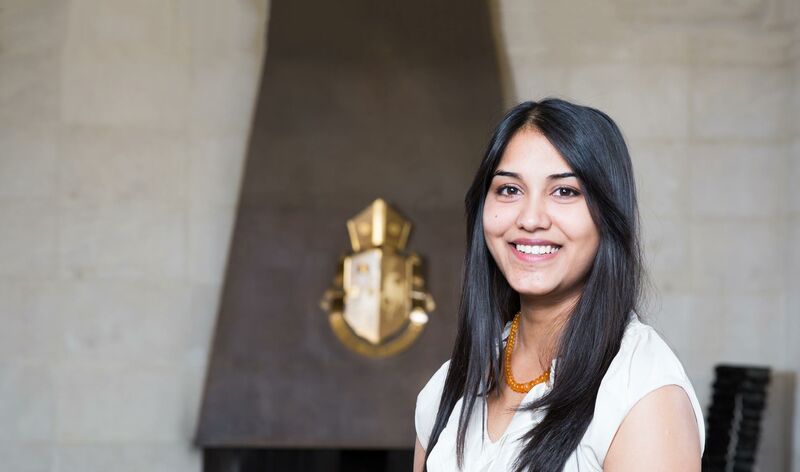 In her second year at U of T, Shreya Nayak represented India at the G20. The G20 simulation was part of “Ordering International Relations in an Age of Empire,” a unique course offered by Trinity College that turns normal classroom expectations on their head. Lectures are posted online and studied on the student’s own time. Scheduled classes are devoted to one-on-one discussions and workshops. The concept, called the “inverted classroom,” is proving a big success at U of T.
Nayak is a gold-medal winning Varsity tennis player and a student ambassador for Enrolment Services. She has ambitions to be a future Rhodes Scholar. Nayak also joined the executive of Enactus, a campus club that helps students develop and launch social enterprises. Her team’s startup, Lumifi, recycles old routers and loads them with educational materials – everything from basic literacy handouts to pre-law curricula. The routers, when installed in a resource-poor school, become a digital library. “We piloted it in three elementary schools in Jamaica last year,” she says. “And in just six months, their literacy rates went up 70 per cent.” Nayak and her team are taking the project to Northern Ontario and next year to India. Nayak has already landed an internship at the US Consulate General in the Political and Economic Affairs Section, and plans to work in international policy once she graduates. She also hopes to run for public office one day. How does community engagement make better dentists?